We have great prices on Nfinity Backpacks, Zuca, Cheer, Dance and Figure Skating Bags! ZUCA Hello Kitty, Beach Bum, Insert Only. Fun in the sun with Hello Kitty. This bold bag with bright colors is ready for summer. Includes mini pouch, while supplies last. Frame Sold Separately. 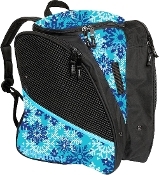 The Transpack Blue Snowflake Figure Skating Bag has an Isosceles Storage System that carries skates, helmet and gear. ZUCA Skates & Bows Insert & Frame. Stylistically enhanced with a cute pattern that incorporates skates and bows, the print on this ZUCA sport is adored by skating sweethearts who reign supreme as champs on the ice. Deluxe skate bag includes two large compartments for ice skates or roller blades, additional accessory compartment, pocket water bottle, cell phone/mp3 player and an adjustable shoulder strap. Available in several colors. These tote bags have got plenty of bubbly personality for sure, but it's all about how you can make them totally your own by adding all kinds of blings and charms! Available in several colors. Despite the obvious light and fluffy feel on the outside, it's definitely a solid build inside. Available in several colors. Just like the original bag but with a little bling and definitely a solid build inside. Don't worry, they may not be that visible but all those open pockets are still there for you! Super cool silver handles and the matching label. Available in several colors. The Nfinity® Classic Backpack is the perfect lightweight bag to get you through the rigors of school to traveling on the road. 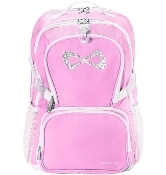 Nfinity Sparkle Backpack. One of the 'Best Selling' bags. 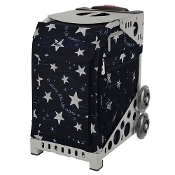 Functional and adorned with a rhinestone sparkle logo. Great for cheer, gymnastics, dance, skating or school! Nfinity Sparkle Backpack. Choosing your favorite color is going to be hard in this lightweight Sparkle Backpack. Great for cheer, gymnastics, dance, skating or school! Rainbow Sequin Backpack. Cute and sassy lightweight backpack covered in dazzling iridescent rainbow-hued sequins is perfect for dance, cheer, skating or gymnastics. Sequin Backpack. Cute and sassy lightweight backpack covered in dazzling sequins is perfect for dance, cheer, skating or gymnastics. The Transpack Aqua Snowflake Ice Skate Bag has an Isosceles Storage System that carries skates, helmet and gear. 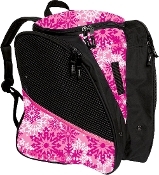 The Transpack Pink Snowflake Figure Skating Bag has an Isosceles Storage System that carries skates, helmet and gear. 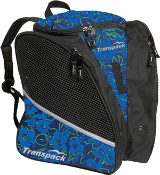 The Transpack Navy Multi Floral Ice Skate Bag has an Isosceles Storage System that carries skates, helmet and gear. The Transpack Pink Orange Leopard Ice Skate Bag has an Isosceles Storage System that carries skates, helmet and gear. 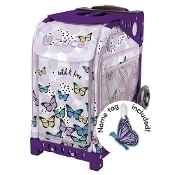 The Transpack Pink/Purple Leopard Figure Skate Bag has an Isosceles Storage System that carries skates, helmet and gear. The Transpack Purple Star Ice Skate Bag has an Isosceles Storage System that carries skates, helmet and gear. 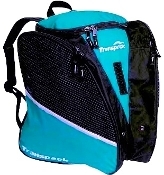 The Transpack Solid Aqua Ice Skate Bag has an Isosceles Storage System that carries skates, helmet and gear. The Transpack Solid Navy Ice Skate Bag has an Isosceles Storage System that carries skates, helmet and gear. The Transpack Solid Pink Ice Skate Bag has an Isosceles Storage System that carries skates, helmet and gear. The Transpack Solid Purple Ice Skate Bag has an Isosceles Storage System that carries skates, helmet and gear. 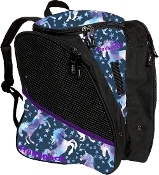 The Transpack Unicorn Figure Skate Bag has an Isosceles Storage System that carries skates, helmet and gear. The Transpack White/Pink/Aqua Aztec Figure Skate Bag has an Isosceles Storage System that carries skates, helmet and gear. ZUCA Anchor My Heart Insert & Frame is Nautical and nice. Sail away with a sea-inspired design even land lubbers will lub. ZUCA April Shower Insert & Frame. Insert Includes matching Name Tag, while supplies last. ZUCA Asphalt Gray Insert & Frame. Take it to the streets with this monolithic mix. Great for kids who play competitive sports. Can be used to sit on when seating is limited during competitions! Made from premium polyester and coated with water-resistant polyurethane. Zippity ZUCA! Zippity Day! With the ZUCA Be Zappy Insert & Frame, everything could start going your way. Can also be used as weekender bags when you purchase the Pro Packing Pouches. ZÜCA Beachy Blue Insert & Frame. An ocean in motion for tons of breezy fun. ZÜCA bags are great for kids in competitive sports. Can be used to sit on when seating is limited at competitions! Made from premium polyester and coated with water-resistant polyurethane. If you like blue-colored berries, you’ll love the ZUCA Berry Patch Insert & Frame. It’s even got a huckle-buckle. Insert includes matching Name Tag, while supplies last. Can you find the diamonds in ZÜCA Chevron Insert & Frame? Insert includes matching Name Tag, while supplies last. ZÜCA Chili Insert & Frame. ZÜCA bags are great for kids in competitive sports like cheer, skating, gymnastics or dance. You can use them to haul all your gear and you can sit on them when seating is limited at competitions. This ZUCA Circlez Insert & Frame is sure to make you feel bubblicious!!! The ZUCA insert is so versatile it can be used for a number of things, from carrying wet sports gear to school books. Made from premium polyester and coated with water-resistant polyurethane. ZUCA Confetti Insert & Frame. A glittering update on a classic style, the Confetti pattern is brought to life with metallic accents that'll make every day feel like a special occasion! Can also be used as weekender bags when your purchase the Pro Packing Pouches. ZÜCA Cosmic Purple Insert & Frame. The heavens aligned to create this deep purple hue! 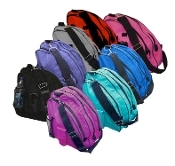 These bags are great for kids on competitive sports teams like cheer, dance, gymnastics or skating. You can use them to haul all your gear and you can sit on them when seating is limited at competitions. ZÜCA Deep Sea Navy Insert & Frame. Ready to Cousteau when you are. These bags are great for kids on competitive sports teams. You can use them to haul all your gear and you can sit on them when seating is limited at competitions. ZUCA First Aid bag for your home, team, company, school, you name it. Fill it with your supplies or visit www.lifesecure.com to buy all the stuff you need. Super reflective front flap improves visibility. ZUCA Flowerz Insert & Frame features pretty pink flowers and was a finalist in the 2009 Annual Color me Zuca Design Contest. These bags are great for kids on competitive sports teams. You can use them to haul all your gear and you can sit on them when seating is limited at competitions. ZUCA Flyer Travel Black & Black. Great carry on bag! You can easily fit between 6-7 days worth of clothing (depending on the season) into one of the best carry-on pieces of luggage you can own. Great for kids who travel with competitive sports teams or the professional and leisurely traveler. ZUCA Flyer Travel Black & Silver Carry-On Bag. You can easily fit between 6-7 days worth of clothing (depending on the season) into one of the best carry-on pieces of luggage you can own. Great for kids who travel on competitive sports teams or the professional and leisurely traveler. ZUCA Forest Green Insert & Frame is fir and away, a classic in the making. The ZÜCA insert is so versatile it can be used for a number of things, from carrying wet sports gear to school books. Made from premium polyester and coated with water-resistant polyurethane. ZUCA Gymnast Insert & Frame. From practicing to competing, you always give it your arabesque. These bags are great for kids on competitive sports teams like gymnastics. You can use them to haul all your gear and you can sit on them when seating is limited at competitions. ZUCA Hanami Insert & Frame features cheery pink cherry blossoms against a bright blue sky make every day feel like the first day spring. ZUCA Hello Kitty Pink Luxe Insert & Frame. Pretty in hot pink, this Hello Kitty® rolling bag is a sweet style that's packed with practicality and has plenty of space for everything you need, whether you're sleeping over at a friend's house or going on vacation. ZUCA Hello Kitty, Good as Gold SE w/ Pink Frame. Go glam with Hello Kitty in whimsical, glimmering gold and shiny crystals! This super-sparkly, winning bag ranks high in fashion … and function. Includes Pink Frame and mini pouch, while supplies last. ZUCA Hello Kitty, Labor of Love, Insert Only. Hello Kitty's subtle leopard print Insert is super-sweet with an edge! Frame sold separately. Includes mini pouch, while supplies last. 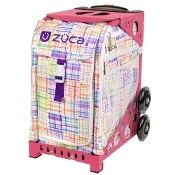 ZUCA Hot Pink Insert is quilted with rhinestone accents. Frame Included. These bags are great for kids on competitive sports teams. You can use them to haul all your gear and you can sit on them when seating is limited at competitions. ZUCA Ice Dreamz Insert & Frame. Glistening. Gliding. Graceful. The dreamy design of the ZUCA Ice Dreamz with rhinestone accents makes your skating fantasies crystal clear. ZUCA Ice Dreamz Lux will let you store your skates in style. You can use this bag to haul all your gear and you can sit on them when seating is limited at competitions. ZÜCA Ice Queen was designed with the elegance of an ice skater in mind. Embellished rhinestones bring the snow to life, making the Ice Queen bag a fashion accessory fit for the beauty of an ice skater. Name tag included. ZUCA Hello Kitty Leopard Insert. Hello Kitty's subtle leopard print Insert is super-sweet with an edge! Frame sold separately. Includes mini pouch, while supplies last. ZUCA Hello Kitty Sail With Me Insert. Set sail with Hello Kitty. You’re ready for a day at sea, with plenty of space for everything you need. Mini Pouch Included, while supplies last. ZUCA Ladybugz Insert & Frame is covered with nature’s most adorable insects. Insert Includes matching Name Tag, while supplies last. You can use this bag to haul all your gear and you can sit on it when seating is limited at competitions. ZUCA Maple Leaf Insert & Frame. Show your Can-do spirit. These bags are great for kids on competitive sports teams. You can use them to haul all your gear and you can sit on them when seating is limited at competitions or tournaments. ZÜCA Midnight Insert & Frame. These bags are great for kids in competitive sports like cheer, skating, gymnastics or dance. You can use them to haul all your gear and you can sit on them when seating is limited at competitions. ZUCA Muca Insert & Frame. Happy MUCA's (moo-ca's) come from California! These bags are great for kids in competitive sports like cheer, skating, gymnastics or dance. You can use them to haul all your gear and you can sit on them when seating is limited at competitions. ZÜCA Mystic Insert & Frame is quilted, rhinestone accented, and very chic. ZÜCA bags are great for kids in competitive sports like cheer, skating, gymnastics or dance. You can use them to haul all your gear and you can sit on them when seating is limited at competitions. The Zuca Obsidian Insert & Frame has red and white logo embroidery. These bags are great for kids in competitive sports like cheer, skating, gymnastics or dance. You can use them to haul all your gear and you can sit on them when seating is limited at competitions. ZUCA Orbz Insert & Frame has lots of vibrant green spots on a bright blue background. Zuca bags are great for kids in competitive sports like cheer, skating, gymnastics or dance. You can use them to haul all your gear and you can sit on them when seating is limited at competitions. ZUCA Paintball Insert & Frame. he theme is paintball, the look is BOLD! These bags are great for kids on competitive sports teams. You can use them to haul all your gear and you can sit on them when seating is limited at competitions. ZUCA Patchwork Insert & Frame has soft pastels in a pretty, pieced-together pattern, this friendly design feels like home--wherever you are. Insert Includes matching Name Tag, while supplies last. Want to make your pencils look extra sharp? This case-in-point holds an assortment of writing elements (and other gadgets) and comes in a rainbow of colors. ZÜCA Pink Sk8 Insert & Frame. 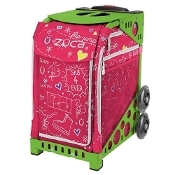 Zuca brought back one of their most popular ice skate designs in bright pink! Oodles of doodles make this pattern a Gr8 way to break the ice (figuratively speaking). Can be sat on when seating is limited at competitions! Oodles of doodles make the ZUCA Pink Sk8 Insert & Frame a Gr8 way to break the ice (figuratively speaking). ZÜCA bags are great for kids in competitive sports. You can use them to haul all your gear and you can sit on them when seating is limited at competitions. ZÜCAPolka Bots Insert & Frame. This bright blue and white insert with playful pink accents connects you to the future for fun. ZÜCA bags are great for kids in competitive sports like cheer, skating, gymnastics or dance. ZUCA Pro Travel Black & Black Carry-On Bag. You can easily fit between 6-7 days worth of clothing (depending on the season) into one of the best carry-on pieces of luggage you can own. Great for the professional, leisurely traveler or for kids who travel on competitive teams. ZUCA Pro Travel Black & Silver Carry-On Bag. You can easily fit between 6-7 days worth of clothing (depending on the season) into one of the best carry-on pieces of luggage you can own. Great for the professional or leisurely traveler or kids on competitive travel teams. ZUCA Pro Travel Graphite Gray & Black Carry-On Bag. You can easily fit between 6-7 days worth of clothing (depending on the season) into one of the best carry-on pieces of luggage you can own. Great for the professional or leisurely traveler or kids who travel on competitive teams. ZUCA Pro Travel Graphite Gray & Black. You can easily fit between 6-7 days worth of clothing (depending on the season) into one of the best carry-on pieces of luggage you can own. Great for the professional or leisurely traveler or kids on competitive travel teams. ZUCA Pro Travel Heather Aqua & Silver Carry-On Bag. You can easily fit between 6-7 days worth of clothing (depending on the season) into one of the best carry-on pieces of luggage you can own. Great for the professional, leisurely traveler or for kids who travel on competitive teams. ZUCA Pro Travel Heather Plum & Silver Carry-On Bag. You can easily fit between 6-7 days worth of clothing (depending on the season) into one of the best carry-on pieces of luggage you can own. Great for the professional, leisurely traveler or for kids who travel on competitive teams. ZUCA Pro Travel Royal Purple & Black Carry-On Bag. You can easily fit between 6-7 days worth of clothing (depending on the season) into one of the best carry-on pieces of luggage you can own. Great for the professional or leisurely traveler or kids who travel on competitive teams. 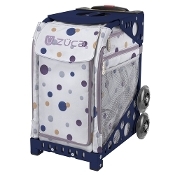 ZUCA Pro Travel Royal Purple & Silver Carry-On Bag. You can easily fit between 6-7 days worth of clothing (depending on the season). Great for the professional traveler, leisurely traveler or kids & parents who travel with competitive teams . ZUCA Pro Travel Ruby Red & Black Carry-On Bag. You can easily fit between 6-7 days worth of clothing (depending on the season) into one of the best carry-on pieces of luggage you can own. Great for the professional, leisurely traveler or kids and parents on competitive travel teams. ZUCA Pro Travel Ruby Red & Silver Carry-On Bag. You can easily fit between 6-7 days worth of clothing (depending on the season) into one of the best carry-on pieces of luggage you can own. Great for the professional, leisurely traveler or kids and parents with competitive travel teams. ZUCA Puzzle Insert & Frame. Green and multiple shades of blue puzzle pieces make up this colorful Zuca insert. Insert Includes matching Name Tag. These bags are great for kids in competitive sports. You can use them to haul all your gear and sit on them when seating is limited. If you love purple then you will love the ZÜCA Rebel Insert & Frame. ZÜCA bags are great for kids in competitive sports like cheer, skating, gymnastics or dance. You can use them to haul all your gear and you can sit on them when seating is limited at competitions. Carry your derby skates in style with the ZUCA Roller Girl Insert & Frame. Put your saucy attitude on wheels and skate your way through a jammin’, blockin’ day. ZÜCA Shine Like The Stars insert and frame. Your talent and excellence are written in the stars. ZÜCA bags are great for kids in competitive sports like cheer, skating, gymnastics or dance. You can use them to haul all your gear and you can sit on them when seating is limited at competitions. ZUCA Silver Shimmer Insert & Frame. Rink-side style is just as important as your look on the ice, which is why Zuca designed Silver Shimmer with silver trims and a whimsical winter wonderland-inspired motif. Oodles of doodles make the ZUCA Sk8 Insert & Frame a Gr8 way to break the ice (figuratively speaking). ZÜCA bags are great for kids in competitive sports. You can use them to haul all your gear and you can sit on them when seating is limited at competitions. ZUCA Sprinklez Insert & Frame. Includes matching Name Tag. ZÜCA bags are great for kids in competitive sports like cheer, skating, gymnastics or dance. You can use them to haul all your gear and you can sit on them when seating is limited at competitions. ZUCA Striker Insert & Frame is a great storage solution for soccer uniforms, overnight luggage and carrying wet sports. Run out of seating at the game? Don't worry, pull our your ZUCA and sit on it. ZÜCA Sunset Insert & Frame has perky, pointed petals in graded shades of pink. ZÜCA bags are great for kids in competitive sports like cheer, skating, gymnastics or dance. You can use them to haul all your gear and you can sit on them when seating is limited at competitions. ZÜCA Sweetheartz ask Will U B Mine? Pack your precious stuff in an adorable bag that will love you back. ZÜCA bags are great for kids in competitive sports. You can use them to haul all your gear and you can sit on them when seating is limited at competitions. ZÜCA Swirlz insert and frame. ZÜCA bags are great for kids in competitive sports like cheer, skating, gymnastics or dance. You can use them to haul all your gear and you can sit on them when seating is limited at competitions. ZÜCA Tiger Insert & Frame. Crouching Tiger, Hidden Stuff. ZÜCA bags are great for kids in competitive sports like cheer, skating, gymnastics or dance. You can use them to haul all your gear and you can sit on them when seating is limited at competitions. Close your eyes and enter the Toucan Dream! We imagined a world where the colorful nature of the Toucan is painted onto its surroundings. ZÜCA Union Jack. This bag is ideal for showing your support of all things Royal! The ZÜCA insert is so versatile it can be used for a number of things, from carrying wet sports gear to school books. Made from premium polyester and coated with water-resistant polyurethane. ZÜCA USA Insert & Frame. ZÜCA bags are great for kids in competitive sports like cheer, skating, gymnastics or dance. You can use them to haul all your gear and you can sit on them when seating is limited at competitions. ZÜCA Wild & Free Insert & Frame. Flutter freely and spread joy with this uplifting design. Insert Includes matching Name Tag, while supplies last. ZÜCA Wonderland Insert & Frame. Walk into a winter wonderland with glistening snowflakes and snowy landscapes. The ZÜCA insert is so versatile it can be used for a number of things, from carrying wet sports gear to school books. ZÜCA Zebra Insert & Frame. Grab this bag today for your next safari adventure! ZÜCA bags are great for kids in competitive sports like cheer, skating, gymnastics or dance. You can use them to haul all your gear and you can sit on them when seating is limited at competitions.